Just thought I'd drop in real quick to say that photos from our elopement are still being featured on the internet. Yesterday we were featured on WellWed and last month we were on Buzzfeed! Shawn and I are both surprised at how much attention our elopement has garnered over the past year. I mean, of course we both love the photos, but we never expected other people to get so excited about them too. 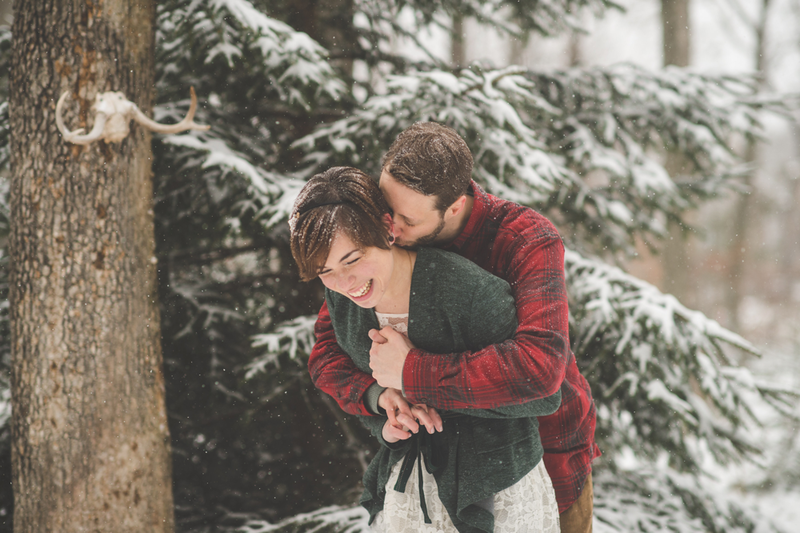 It really warms our hearts, and we hope that they help inspire other people planning an intimate / rustic / outdoor / winter wedding or elopement. The internet is such an amazing place for anyone planning a wedding these days; I certainly took advantage of pinterest and wedding websites when we were planning ours... and we're so excited to be able to give a little inspiration back to the wedding community with our own wedding photos and experience. If you're new to the blog, or if you've never clicked on the link in the sidebar, I created a wedding page that links to my original post about our elopement, and all the places it has been featured online. Check it out! Also, our one year anniversary is coming up in less than two weeks, and I have a really fun post planned! Stay tuned! I absolutely LOVE your wedding photos! It looks like it was a perfect day. SO many people seem to pair weddings with spring and summer, I thought it was beautiful and refreshing to see your snowy ceremony. Thank you!! We liked the change of scenery, after having attended three spring/summer weddings last year.